Before using eSign with your Licences, it needs to be configured first. Please take a look at the configuration guide if needed. Raise a licence as usual. To remind yourself you can view the article regarding raising licenses. Preview as usual. In addition to printing an email manually you have now have an option to send via eSign. 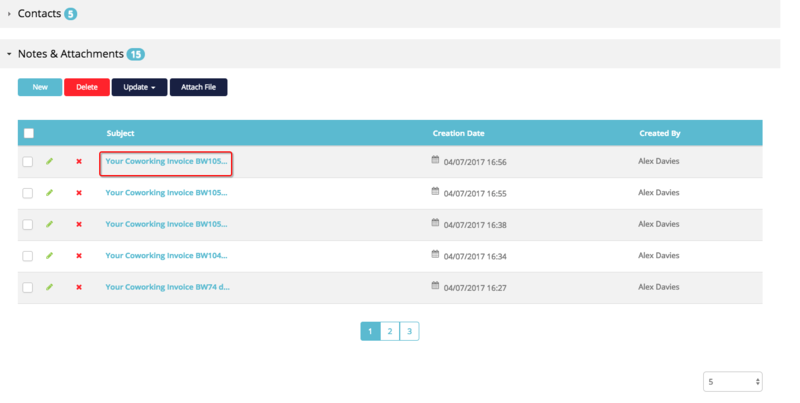 If your template has fields for one Customer Signature, you will be asked to provide the email address and name of one customer. If your template has fields for more Customer Signatures, you will be able to specify more email addresses and names as necessary. 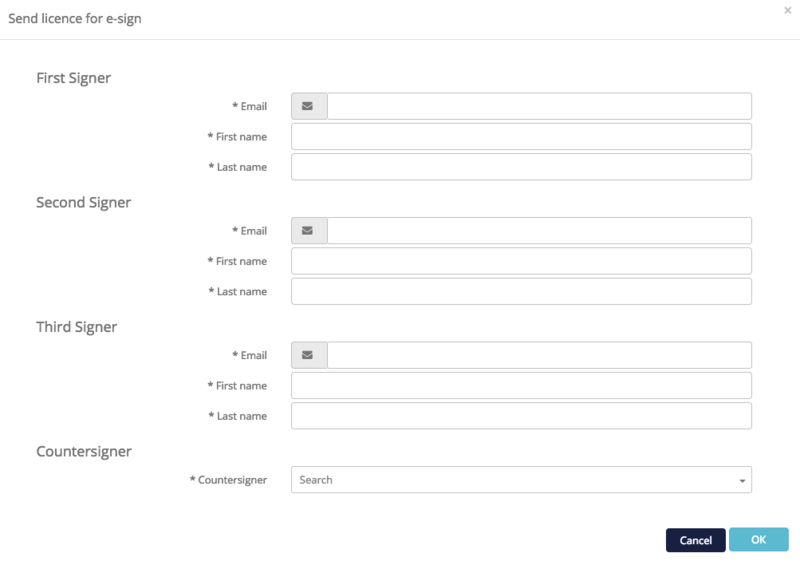 If your template includes a countersigner field, you will also find a counter signer drop down which will allow you to choose a user from the list of countersigners (as defined in your settings). The recipients will receive an email with a message displaying who requested your signature, with a link to the licence. They can click the Get Started button to be directed to the first field that requires signing. They will see the all fields which require an entry indicated on the license. When clicking on Click to sign or Click to initial you will be given four options. User smartphone: You will be asked to take a photo of you the signature, email it to sign@hellosign.com with a specific subject code. When completing the process, recipients will be asked to agree to confirming the legality of the document. 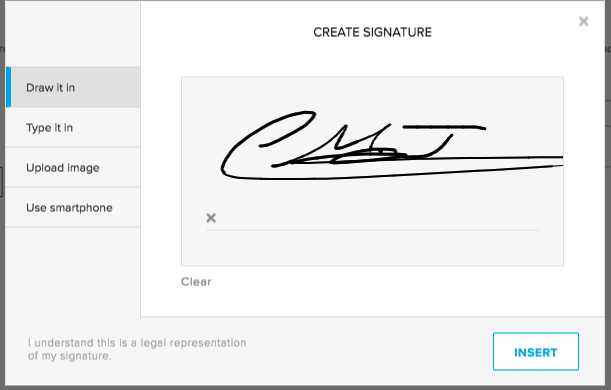 If there are multiple customers, a new email requesting a signature will also then be sent to them, followed by the countersigners if any were included within the template. Upon completion of all these steps an email will be sent to the salesperson informing them that the license has been signed by all parties. There are a few ways in which you can keep track of your licences once they have been sent. 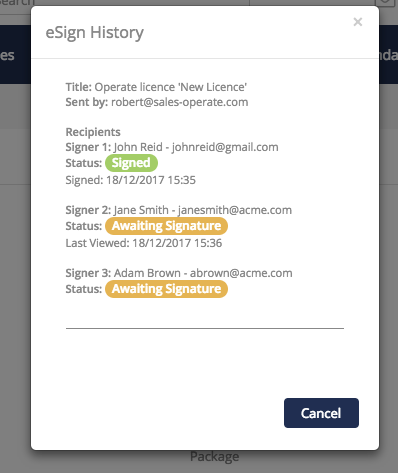 When you have sent the licence, an eSign History button will be visible on the Licence record. Selecting this will show you a history of each time the licence has been sent. For each recipient you will see their status (Awaiting Signature, Signed, or Declined). Additionally, the 'Last Viewed' field will display if they have viewed the licence while they are still yet to sign. When a Licence is issued and signed via eSign, you can see the progress via the Licence status. Issued (awaiting eCounter Signature) - the Licence has been signed by all customers, and has been sent to the countersigner for their signature. Issued (eSigned) - this means that all parties (customers and countersigners) have signed the Licence. If you want to be kept up to date with the progress of a Licence, you can set up a workflow and send yourself an email or an SMS when the status is updated. For example, set up a workflow to alert you when a Licence status is updated to 'Issued (awaiting eCounter Signature)' to find when to follow up with your counter signer. Once all parties have signed the license will be saved within the Account record. You can find them under Member > Accounts. Select the account you seek to view the details of the license and account by clicking on the name of the account. Under the Notes & Attachments tab you can preview a copy of the license by choosing a subject line of the email, and then selecting View File. Every time a license goes through the eSign process and is successfully signed by all parties it is listed within the eSign Audit found under Settings > General > Customize > Licenses.